Picture a stadium packed with 110,168 architects. Now imagine it's got only 112,600 seats. That's basically the architect job market in the U.S. I know, right? Tighter than L.A.'s building codes. Worse, only the top row pays good money with attractive work environments. Is it any wonder your architecture resume must stand out like Burj Khalifa? How to write an architecture resume that will land more interviews. Tips and examples of how to put skills and achievements on an architecture resume. How to describe your experience on a resume for architecture jobs to get what you want. Here's a sample resume for an architect made using our resume builder. Architecture Resume Example - See 20+ resume templates and create your resume here. What's the Best Format for an Architecture Resume? Meet the hiring manager at the biggest, best architecture firm on the planet. Her name's Jan. Please, no, "Marsha, Marsha, Marsha" jokes. She's buried beneath enough architectural resumes to wallpaper One World Trade Center. If you could meet her – if she only knew what you can do, she'd hire you in a millisecond. The trouble is, your architectural resume format hides your talents like underground parking. First, the two-page resume screams TL/DR (Too Long, Didn't Read). Next, don't resort to over-the-top gimmicky resumes. Creative resume designs on ceiling tiles or building models aren't up to code. Use a trusted format like reverse-chronological. 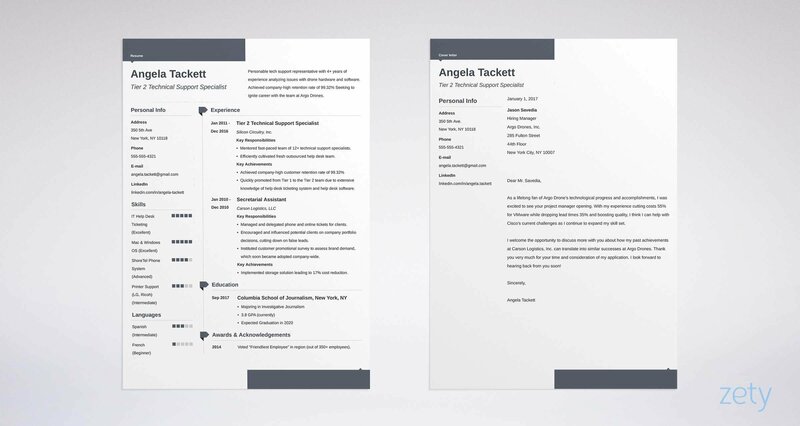 It's the best architecture resume format because it puts your biggest wins up front. That's key, since recruiters spend just six seconds with each resume. Use clean fonts, big headings, and negative space. Finally, save your architecture resume as a PDF. Architect resume PDFs preserve their formatting in transit. MS Word or .doc resumes can fall into disrepair between machines. Pro Tip: Does the firm accept resumes for architects as PDFs? Some don't. Check the job offer. Don't want your resume design set in stone just yet? Check out other formats for your best architectural resume: "3 Resume Formats: How to Choose the Best One [Examples]"
Remember, the hiring manager will spend just six seconds with your architecture resume. That's just enough to keep her reading. Do that with a resume summary or a resume objective. A resume summary convinces by showing your experience. Use it if you've got skyscrapers-full. A resume objective shares your passion. It's a snapshot of your laser-leveled goal. Check out these two very different design architect resume samples. Registered architect skilled in CAD design, Revit, building codes, and business knowledge. Seeking a position in design for a high-level architecture firm. What's wrong with that? Nothing, on its own. But, like one McMansion in a massive development, it's too much like all the rest. Now what if we add some measurable achievements? Highly creative AIA registered architect with 9+ years experience. Seeking position as design architect with AECOM. Designed 25+ multi-million dollar jobs for DDG, at 30% less cost than competitors, with 15% less rework than colleagues. Received 15 client commendations. Wow. Now you look like Mike Brady with a Pritzker Prize. But what if you're writing an architect resume for an internship? Don't have experience? Think your intern architecture resume will look like a new AutoCAD document? Write an objective statement. They're for architecture student resumes or internships. Passionate architecture student, skilled in CAD design and budgeting. Seeking an internship with a fast-paced design and engineering firm. No experience yet but eager to get started. That's not awful, but it'll ultimately fail to please, like that Elephant Building in Bangkok. Enthusiastic architecture student, excelled in CAD design coursework. Won second place in the Better Philadelphia Architecture Competition for inexpensive design. Created 3D models for a hotel made of shipping containers. Nice. You might be the next Frank Gehry. But how did an architecture student get that kind of experience for a resume? She did it by digging into her past, and taking a couple proactive steps. I'll show you how in a minute. Pro Tip: If you're licensed, you took 7 exams and 1,200 internship hours. That's impressive, so show it in your architect resume objective statement. Does the way you show experience matter on an architecture resume? Only as much as structural supports. So, let me show you how to list experience that gets attention like Zaha Hadid. List your most recent job first. Add 5-6 bullet points that mix duties and accomplishments. Here's the magic: Fit those bullet points to the job description. Picture a job that values design, big projects, high-quality, and cost-savings. Key architect at a high-end architecture and engineering firm. Designed and developed 25 multi-million dollar jobs through all phases of work. Received 15 client commendations for excellence of design. Consistently delivered project budgets to 98% accuracy of finished costs. Created bid-winning designs at 20%-40% less cost than competitors. Wow. Maybe you didn't design the Lotus Temple, but I'll bet five years of picking out carpet swatches that you'll get the interview. It works so much better than the next of our architecture resume examples. Senior architect at a major architecture firm. Regularly designed and developed large projects. Responsible for budgeting all projects. In charge of delivering architecture and building projects to budget. Worked with builders and clients to ensure good communication. There's nothing wrong with that. There's nothing wrong with tract housing, either. But neither draws the eye. Next, what if you're writing an architecture student CV? Anything else at all that sounds like an achievement. Architect Experience: No experience yet, since I still have yet to land my internship. Just awful, right? Like a modular home, but without the charm. Created 3D CAD drawings for a home renovation project. Designed a stage for a local theater group. Second place, Annual Lost and Found architecture competition. Attended the Monterey Design Conference, 2017. Wow, right? You might just be the next I.M. Pei or Norman Foster. But the secret is, it didn't take much time to do all this. The point? 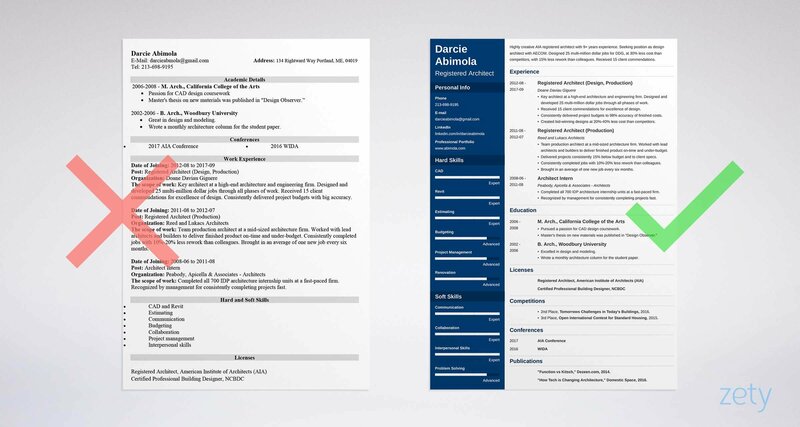 With a little thinking, even an architecture student resume can turn some heads. Look online for freelance or volunteer architect jobs. Attend a conference or enter a competition. Anything that shows your dedication looks great on a resume for architects. Pro Tip: Already did your internship? List it as experience, like any job. Check our great architect resume template up top for an example. Need more tips to put your architecture resume in the Gensler category? See this guide: "How to Put Achievements on a Resume - Complete Guide (+30 Examples)"
Our hiring manager, Jan? She just stopped reading your great architecture resume. Why? Because your education confused her. The path to a career in architecture is incredibly complex. Your architectural resume can't be. List your bachelor's degree, and master's degree if you have one. Imagine a job that values CAD design, modeling, and working with new materials. That doesn't fit the job offer. It's like they asked for the Sydney Opera House and got a Walmart Supercenter. Pursued a passion for CAD design coursework. Master's thesis on new materials was published in "Design Observer." Excelled in architect design and modeling. Wrote a monthly architecture column for the student paper. Pow. Tongue-in-groove, right? Everything fits. It just takes attention to the job offer, and a little shopping in your past. Pro Tip: Should you show your GPA or nix it? If it's a proud achievement, celebrate it. Otherwise, encase it in 500 feet of concrete. Want to design resumes for architecture that pop out like the Guggenheim? See this guide: "How to Put Your Education on a Resume [Tips & Examples]"
"Let's definitely interview this one." Your architecture resume can make the hiring manager say the words above. You earned those skills, so you want to show them off. But to a manager, it's as impressive as a trailer home. So, list just the skills you see in the job offer, plus a few. Then, prove them in your bullet points. Check out the next of our top architect resume examples. Skills in the job offer: Adherence to Budgets, Rework Reduction, New Business Generation. Skills in your architecture resume skills list: The above plus Communication and On-Time Delivery. Team production architect at a mid-sized architecture firm. Communicated with lead architects and builders to deliver finished product on-time and under-budget. Delivered projects consistently 15% below budget and to client specs. 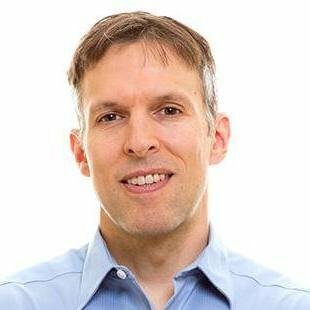 Consistently completed jobs with 10%-20% less rework than colleagues. Brought in an average of one new job every six months. Paydirt. You list the right skills, then you prove them. The hiring manager just stopped fiddling with her scale model of Falling Water and reached for the phone. Here's a list of common architecture resume skills. Add to them by trolling job offers online. Follow the plan above, and your architect resume will make you look like the next Santiago Calatrava. Pro Tip: Show examples of your skills in the experience, education, and "other" sections of your architecture resume. Want to elevate your skills section? Follow the professional architectural resume template up top. Also, see our guide: "+30 Best Examples of What Skills to Put on a Resume (Proven Tips)"
You only had to pass seven ARE exams to get your architect's license. So it doesn't matter how you show it on your architecture resume. Right? Of course that isn't true. You got your 5-7 year degree, completed a 2-4 year internship, and passed 7 rigorous tests. That alone should blow the modular-arches-patterned socks off any hiring manager. Also, put AIA after your name, and add it to your work experience. It'll show the manager you're qualified at a glance, from anywhere on your architect resume. Anything less would be like covering St. Paul's Cathedral with McDonald's logos. Writing a landscape architect resume? Pro Tip: Got 40 floors of certifications? Use the few that really matter for this job offer. A resume for architecture is not a laundry list. Picture a hiring manager's desk. On it, near her 2B or Not 2B coffee mug, sit two piles of architecture resumes. One is 250 deep. That's the rejects pile. The other has just 50 resumes. That's the "second look" stack. Your resume's in there. Everyone in pile #2 has similar experience and skills. With dedicated "other" sections that show your passion and commitment. Add anything that shows you as the Mackey Mitchell type. 2nd Place, Tomorrows Challenges in Today's Buildings Competition, 2016. 3rd Place, Open International Contest for Standard Housing, 2015. "Function vs Kitsch," Dezeen.com, 2014. "How Tech is Changing Architecture," Domestic Space, 2016. That gets attention like the Dancing House in Prague. Awards, exhibitions, projects, conferences, publications, and professional association memberships all make excellent detail on an architecture resume. Should You Have an Online Portfolio? How can a single sheet of paper convey your talent? So, have a pro architect resume portfolio. A portfolio resume for architecture shows the depth and color missing in a resume. Architecture resumes and portfolios go hand in hand. If you're a design architect, fill it with designs and images of finished structures. Are you a production architect? Use pictures of your work. Still a student? Concept drawings and pics of models will work great. Pro Tip: This advice works just as well on a landscape architecture resume or an architectural designer resume. Read the offer, then customize. Need more meat for great architect resume "other" sections? Use this guide: "+20 Best Examples of Hobbies & Interests To Put on a Resume (5 Tips)"
"Nobody reads architect cover letters." Said every architect who thinks they're hard to write. The truth is, 40% of hiring managers consider them essential. Not sure which kind you're dealing with? Write a cover letter for your architecture resume. Make it personal. Use the hiring manager's name. Include a fact or two about the company. Make it useful. Show metrics that fit the job requirements. I loved Doane and Daviau's design for the new Crosslake Junction Health Clinic. Your press release highlights your commitment to lowering costs while raising quality. As a production architect at Peabody & Apicella, I consistently delivered projects 15% below budget, with frequent client commendations for design. End it with a call to action like, "I'd welcome the opportunity to talk more with you about your needs." You can use this same strategy in an interior design resume. Pro Tip: Don't forget to follow up. Maybe you got rejected or the manager forgot. Either way, a follow-up gives your architect cover letter and resume a second chance. Want a concrete example for your good architect resume and cover letter? See this guide: "How To Write A Cover Letter [Complete Guide With Examples]"
You're probably making a mistake with contact info on your architecture resume. But what about LinkedIn? Twitter? Or a personal portfolio resume site? If other candidates add those and you don't, they'll grab the manager's interest while you fade into the masonry. Pro Tip: Not sure what to put in your LinkedIn profile to give your architect resume it's best chance? See our guide on how to make a great LinkedIn profile. Want more tips to help you write a professional resume for architecture? See this guide: "How to Make a Resume: A Step-by-Step Guide (+30 Examples)"
Start with the job offer. Highlight skills and requirements. Then use them to customize your architect resume. Match the bullet points of your resume for architecture to the skills you highlighted. Add "other" sections to an architecture student resume. They'll prove you're stuffed to the rafters with passion and commitment. Don't forget to include a cover letter in your job application. Do you have questions on how to write a great resume for architecture? Not sure how to describe your skills or achievements? Give us a shout in the comments! We love to help!